08/15/15: Inspired by Amanda Jean at Crazy Mom Quilts (http://crazymomquilts.blogspot.com/2011/04/living-up-to-my-blog-name.html), I began gathering scrap fabric strips, cutting equilateral triangles from waste printer paper and stitching string pyramids. The triangle units were stitched on my 1925 Frankenstein treadle (Singer/National) sewing machine. The units are then hand stitched into rows. I’m hoping the top continues to grow into a sofa quilt. 09/20/15: Have taken a break from this top to work on others but to satisfy a craving to use the treadle machine, I put together 25 more string triangle units today. I’m liking the quilt a little more and suspect the feelings may grow. If this top becomes nothing else, I may make it into a poncho. I’ve recently purchased some Thermore batting for just such a project. 12/8/15: After deciding to make this into a single bed sized top (with DH’s encouragement), I’ve picked up working on it again. Making the triangle units on the treadle machine is a true addiction but as the top continues to grow, an end is in sight. 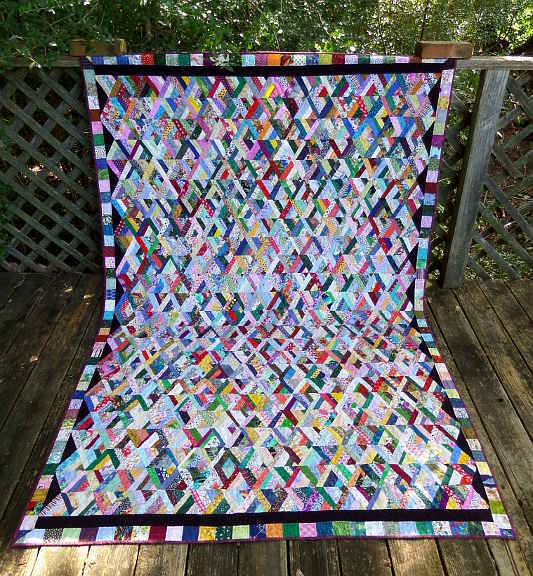 It currently measures 55″ x 86″, leaving space for a plain border and lots of extra triangle units. Dog quilt? Potholders? I’ll add them to the ever-growing ‘Extras’ container to possibly use at a later date. 1/5/16: Added black triangles to straighten the edge, then a border of 2½” squares to completed the top. Not looking forward to basting so I’ve put it aside for a little while. 2/12/16: Pieced together backing, sandwiched and began basting. Still haven’t decided how it will be quilted but I NEED a hand stitching project. Considering either a straight line grid of some fashion or possibly a large Baptist fan design. Bob is leaning toward Baptist Fans. Regardless, it will be a challenge with all these seams. The more I look at this top, the more I like it! 6/4/16: Over half finished quilting big Baptist fan design. It is a challenge to quilt over all the seams but I’m doing my best and hang the rest! DH likes the quilt so I’m inspired to finish it for him. 8/30/16: Though DH didn’t live long enough to enjoy using this quilt, I’ve continued to work on it. The hand quilting is finished. I plan to apply the binding over the next few days. 9/9/16: Bob’s quilt is finished and washed. All that is left to do is make and apply a label. That task will be done shortly when the ordered supplies finally arrive. 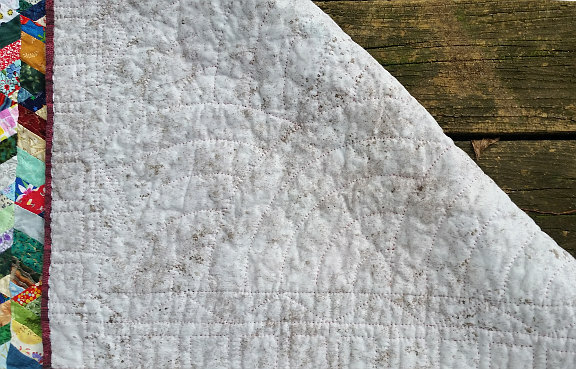 The finished quilt measures 92″ x 60″ and was machine and hand pieced and hand quilted. It was made 100% from scraps, including the backing. The quilting was done with red YLI quilting thread leftover from another project. The batting is Thermore, originally designed for hand quilted clothing and the binding is red/black mosiac print left from another project. 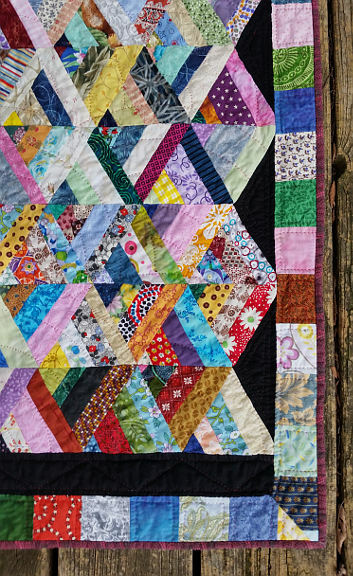 The more I look at this quilt, the more I like it. There are so many possibilities for new designs using this basic string pyramid triangle. Such fun! I surely wish Bob was here to see and enjoy it.